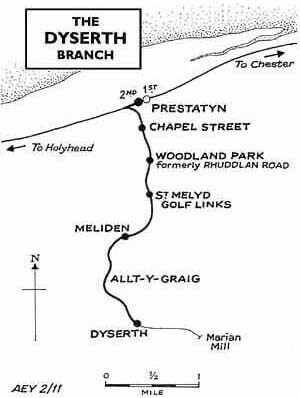 Notes: Prestatyn 2nd station is on the route of the Chester & Holyhead Railway which opened in stages between 1 May 1848 and 18 March 1850; the C&HR was absorbed into the London & North Western Railway on 1 January 1859. Prestatyn 2nd Station opened on the 28th of February 1897 and the original Prestatyn Station was closed. The new station was a typical LNWR one of the period. It was immediately west of the original station and had four platform faces, two of which were on an island platform. The platforms were of timber construction and very long. A bridge passed over the station at approximately its midpoint. Station buildings housing all of the usual facilities were located on each platform east of the road overbridge. They were timber-built and included canopies. A footbridge, located at the eastern end of the station, provided a link between the platforms, which were numbered 1 to 4. Platform 1 was on the south side of the line, 2 and 3 on the island platform and 4 on the north side of the line. Platforms 1 and 2 served westbound trains whilst 3 and 4 served trains going east. There was a small goods yard east of the station, on the south side. There were two sidings and a loop. One siding passed a loading dock before entering a goods shed; the shorter second siding ended end on to the dock. There was a 1 ton 10 cwt crane in the yard. The station was served by a variety of long distance and local trains to destinations including London and the major cities of the north-west and the midlands. During the summer months Prestatyn was extremely busy as the town had developed into a popular tourist destination. operated by a ‘railmotor’, and to accommodate it a low level platform formed out of railway sleepers, infilled with cinders, was constructed at the western end of platform one. The platform faced southwards - away from the main line - and at its rear a fence protected passengers from passing trains. Because of the direction that the Dyserth Branch junction faced the railmotor had to run westwards from the platform for a short distance. It then had to stop and reverse onto the branch. The same operation took place in reverse when it arrived at Prestatyn from Dyserth. When the line opened, there were 14 trains in each direction but no Sunday service. By 1922 the frequency had increased, with 16 trains in each direction Monday - Friday (one down train did not call at intermediate stations) with 15 on Saturdays. [free platform ticket] operate in push-and-pull mode. On 1st January 1923 the LNWR became part of the London Midland & Scottish Railway (LMS). In September 1930 the LMS discontinued the Dyserth Branch passenger service. The loss of the traffic had little effect on Prestatyn station, which, during the summer of 1932, was served by a regular service of stopping trains between Chester and Rhyl and trains to Bangor, Carnarvon, Derby, Liverpool, Llandudno, Manchester and Oldham. increased traffic. In the 1960s competition from road vehicles was affecting both passenger and goods traffic, and the goods yard closed on 4 May 1964. In the early 1970s sections of the Chester and Holyhead route reverted to double track. 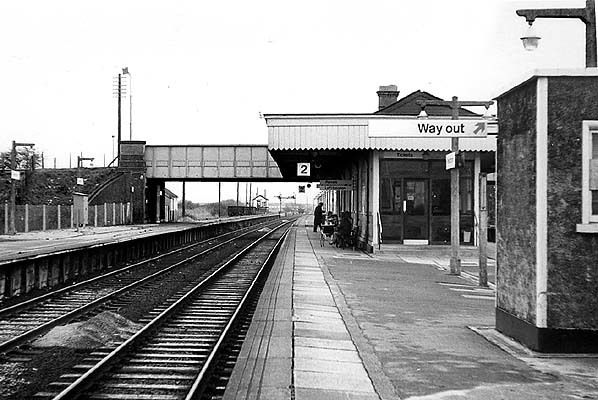 By 19 April 1971 platform 4 at Prestatyn had lost its track, and platform 1, although it retained a line, hosted few passenger trains. Also by this date the buildings on platform 1 and 4 had been demolished. 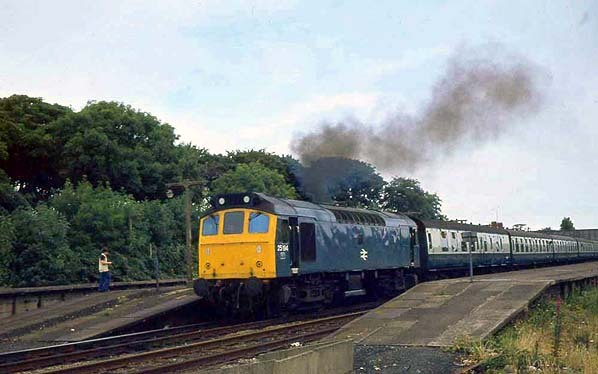 In 1973 regular goods services ceased on the Dyserth Branch, and it was lifted in 1980. 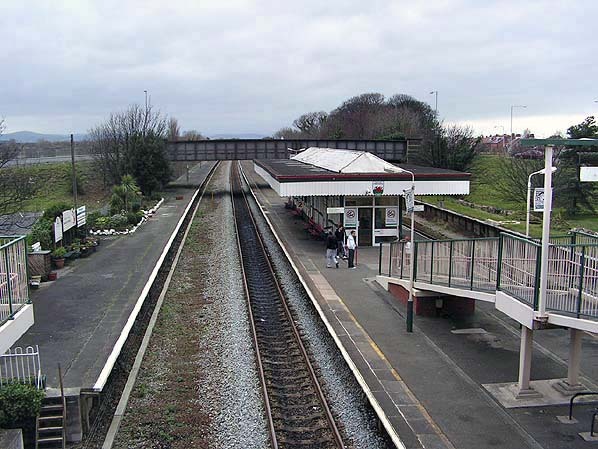 At this time platform 1 lost its track, and Prestatyn became a two platform station on a double-track line. The former platforms 1 and 4 survived intact until the latter part of 2010 when the station was refurbished. At this time the sections of former platforms 1 and 4 east of the road overbridge were demolished. In 2011 Prestatyn continued to be served by both local and long distance trains. Regular services ran to Holyhead, Llandudno, Chester, Manchester, Crewe and London. Further reading: The Chester & Holyhead Railway by Peter E. Baughan (1972) - Volume 1 & 2, Published by David & Charles ISBN 10-0715356178 and Regional History of the Railways of Great Britain Vol. 11, North & Mid Wales by P.E. Baughan, published by David & Charles (1991) ISBN-10: 0946537593. Looking west at Prestatyn's second station in the first decade of the 20th Century. The picture shows a busy scene and was probably taken in the summer months when many thousands of people would visit Prestatyn as it was a popular seaside resort. 1899 1:2,500 OS map shows the bay platform for Dyserth trains even though they did not use it until c.1920s. 1912 1:2,500 OS map - there has been some realignment of the tracks to the west of the station. 1961 1:2,500 OS map - the platforms have been lengthened. 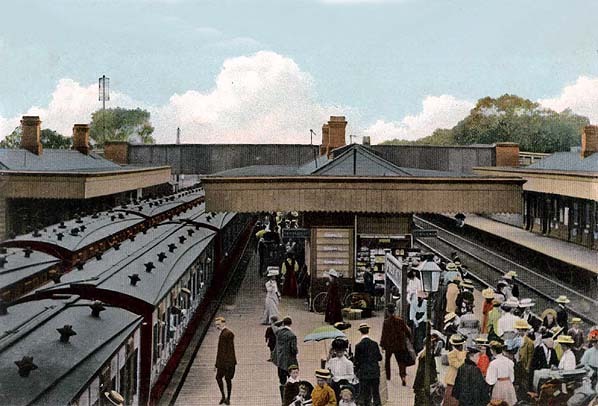 The Dyserth platform at Prestatyn station in 1905. When the Dyserth service was introduced a low platform was provided at the western end of the station. It was later replaced with a bay platform. 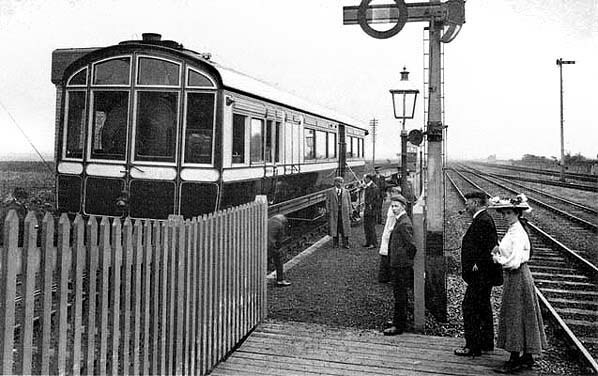 The train standing at the platform was an LNWR railmotor. 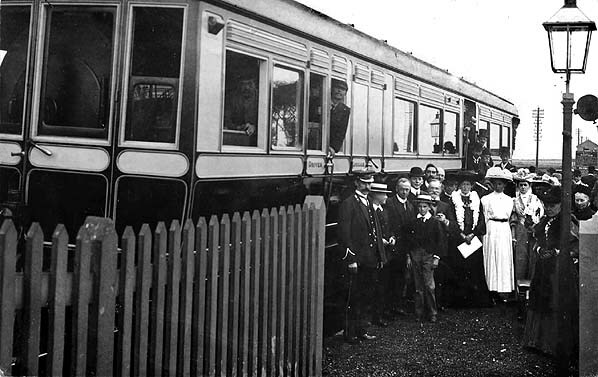 The simple low level short platform provided at Prestatyn station for the Dyserth service as seen in 1910. The railmotor that operated Dyserth service at that time can be seen standing at the platform. The lines to the right are part of the Chester to Holyhead main line. A fence at the rear of the branch platform protected passengers from main line trains; however the lady to the right appears to be standing closer to the main line than would be considered safe. 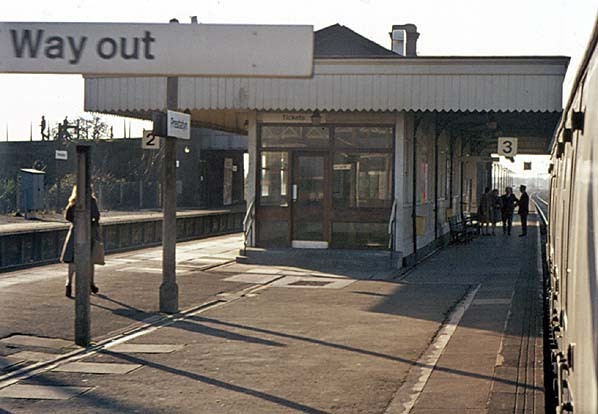 Within ten years a bay platform at the rear of platform 1 replaced the simple platform shown in this picture. 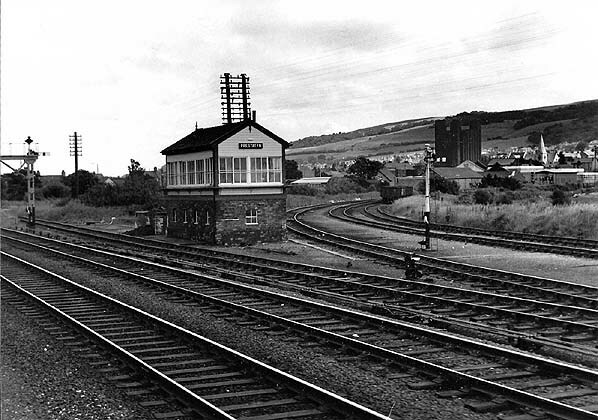 The junction with the Dyserth branch east of Prestatyn station in July 1971. Looking west along platform 2 at Prestatyn in December 1972. On the far side of the bridge to the left is a bay platform at which some mineral wagons are standing. This platform served the Dyserth Branch until September 1930. Dyserth trains left Prestatyn travelling westwards and stopped at a point just west of the signal box seen in the picture, before reversing eastwards to take the branch south to Dyserth. Looking west along platform 3 at Prestatyn. The building was an LNWR structure, in place from the station’s opening. It had been modified slightly by 1975, when this picture was taken, by which time it was the only surviving station building. 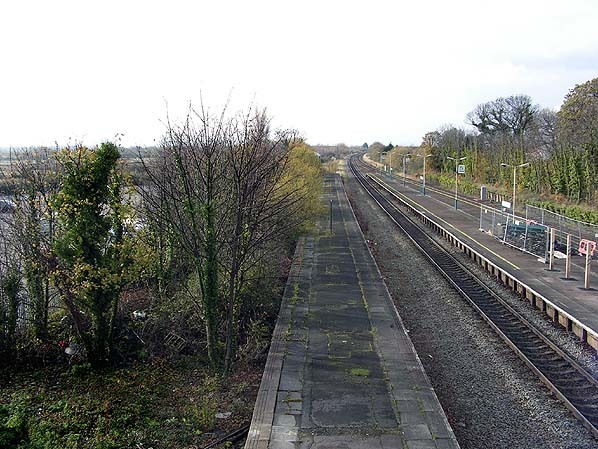 Prestatyn Station looking east in February 2008. Looking west at the west end of Prestatyn station in November 2010. The platform in the centre once served the Dyserth Branch (left) and westbound slow line trains (right). Since the 1980s it has been without track. When Dyserth services began there was only a low level platform at the far end of the westbound platform; Dyserth trains later ran into the bay platform, seen here. Dyserth trains had to depart west to a point just beyond the signal box - seen in the middle distance; they then reversed east to follow the line to Dyserth, as its junction with the main line faced west.